I Like to Move it, Move it! | To Be, To Be. Tutubi. 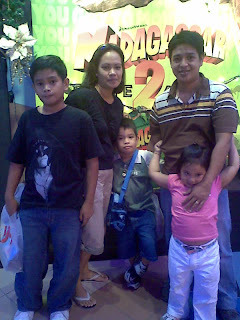 We watched Madagascar as part of our company's Family Day celebration last weekend. I think think the movie has more adult themes than the previous one. While watching, I was looking sideways at my kids if they were enjoying themselves and they seemed to like it very much, though not as much as the first movie. My husband was also enjoying himself. At some scenes, I cant stop myself from laughing out loud because my kids were very happy. Oh well, wish ko lang hindi nila nage-gets yung mga pang-adult na usapan. Fit for royalty na yata ang blog ko!!!! I saw your post about my post (100+ Money Saving Tips) and I love the way you made it. Thanks for finding my post informative. However, I cannot leave a comment there and I think nobody can. I suggest you remove the link on the title post since there are already links in between the post. In addition, I can't read clearly your posts. I suppose black background does not fit red fonts. I think it would be better if back font and white background. Another thing, I also suggest that you add Name/URL as additional identity to leave comments. I cannot use my main blog as the link to my name.